class="page-template-default page page-id-361 cookies-not-set wpb-js-composer js-comp-ver-5.4.7 vc_responsive"
Nature is at your door – a large and open space, little explored. The rock is beautiful, austere, and the countryside can be harsh. The terrain is rugged, stony and uneven. So don’t forget that you need to be well shod ! The region is very dry and extremely hot in the summer. Don’t count on finding any watering point on your walks. So put on your hats, fill up your water gourds ! The splendid countryside will incite you to take your time in such a way that the indicated distances of a walk can only be considered relative. We can advise you on the walks before you go, and also lend you a detailed walking map (IGN 2642 ET). Enjoy your discovery and holiday ! At the foot of the Mas des Elfes, a footpath climbs up to the “Roc Pointu”. There, aplomb with the “Grotte de Clamouse” (Clamouse Caves) and the “Pont du Diable” (Devils Bridge) you can find the “Statue de la Vierge” (Statue of the Virgin Mary), erected in 1950, who opens her arms towards a breath-taking panoramic view of Saint Jean de Fos, the plains of the Hérault river and close villages : Aniane, Gignac, Saint André de Sangonis. At a relaxed walking pace of 30 minutes, is all you need to take you to the quiet and peaceful area, where respiration, meditation & reflection will just naturally occur. 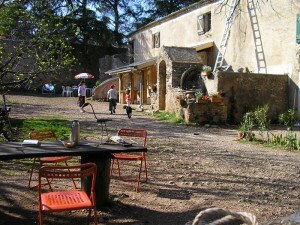 Leave the “Mas des Elfes”, and walk up the “Rue de l’Aire”; then turn left at the “Maison de la Poterie”. 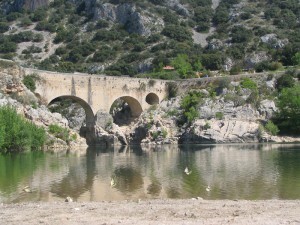 Go down to the “Pont du Diable” then follow the Herault gorges until the “Grotte de Clamouse”. 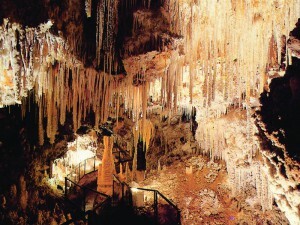 Whilst there, a guided visit will allow you to admire the heart of the underground world of outstanding structures and formations of stalagmites and stalactites. A cave unique in its type, where the visit is refreshing and will be very much appreciated in the summer ! On the way back, you will find the fascinating “Site” of the natural basin of the river at the foot of the “Pont du Diable”. There you can bath, swim and even try some canoeing to admire the gorges from the water. So don’t forget for this walk to take a sweater (for the cave visit), a beach towel and swim wear for the river. Leaving the “Mas des Elfes”, go up the “Rue de l’Aire” and at the angle of the “Maison de la Poterie” turn left. Go down and across the “Pont du Diable”. After the parking of the “Grand Site”, turn left and follow the footpath identified with the green markings. 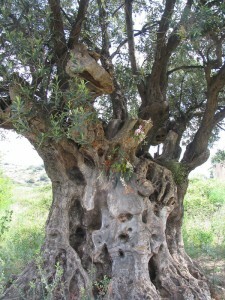 The footpath goes through olive groves and vines, delimited on the right by the Gignac canal. After a little less than one hour of walking, you will find the “Chapelle Saint Sylvestre” (Chapel of Saint Sylvestre), classified as a place of pilgrimage. Once there, you will find a shaded picnic area where you will be able to fully appreciate the chapel and the surrounding environment. On the north side of the Chapel, starts a footpath which orientates progressively towards the North/West. Follow this path until the junction with the forestry road. Turn right, then at the following junction turn left. 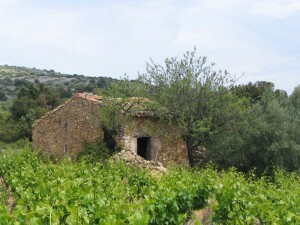 The footpath will lead you to the picturesque abandoned hamlet of “Montcalmès”. After visiting this old farming hamlet, take the principal road going to the West, up to the junction with the forestry path. In front of you, and slightly to the left, you will see a Television Mast. Go towards the mast, go around it, and slightly down the stony slope, take advantage of a superb panoramic view of the “massif de la Séranne” (Séranne mountains), the “Cirque de l’Infernet”, the “Chateau du Géant” (Giants Castle), as well as the village & Abbey of “Saint Guilhem le Désert”, and the Hérault river. To start off again, go back the way you came until the forestry path, then go directly south following the footpath marked red – the edge overlooking on the lefthand side the Hérault River until you reach the “Pont du Diable”. For this walk (1/2 day minimum), we can also lend you a pair of binoculars ! Leaving the “Mas des Elfes”, go up the “Rue de l’Aire” and at the angle with the “Maison de la Poterie”, turn right, then leave the village going behind the Cross and follow the footpath marked green. Five hundred meters further on, on top of the hill, turn right at the crossroads. Follow the small road climbing upwards in lacing curves and continue the footpath indicated by the green markings. The climb (approximately one and a half hours) will take you to the “Maison Forestière des Plos” (“Plos” in Occitan – the local language dialect means : flat area surrounded by slopes). Halfway round a bend, and just before starting the straight line along a crest, you will go past a smugglers cave. Arriving at the “Plos”, in this wild and grandiose environment, you will find the Forestry House, property of the O.N.F (Office National des Forêts – National Forestry Office). 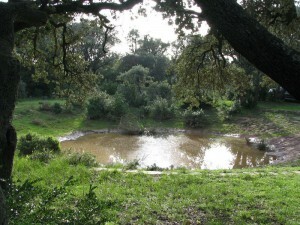 The area is an oasis of vegetation, with the vestiges of a botanical garden and arboretum. The shade is plentiful and sufficient for an excellent picnic. Behind the Forestry House, on the right, a footpath leads to a panoramic view created above the “Combe de Brunan”. Going back to the footpath (marked blue), you will walk through a forest of Salzman pine trees and find, slightly off to the right, the “cave de Brunan” (cave of Brunan) – so think of taking a torch with you ! Climb a little further along the footpath and you will arrive at an excellent view point on the “Gorges de l’Hérault” (Hérault Gorges); further on, there is a small pyramid of dry stones. From there, go right, still following the blue markings and you will rejoin the footpath (marked green) leading back to Saint Jean de Fos. Leaving the “Mas des Elfes”, going up the “Rue de l’Aire” and at the angle de la “Maision de la Poterie”, turn right, then leave the village and going behind the Cross follow the footpath marked green. Five hundred metres further, go across the intersection and continue straight on. Follow the small road, which becomes a footpath, off to the right & runs parallel to the vines, it comes out at the highest point on the plateau, where you can find the Centennial Olive Tree and a “Mazet” (a stone house) sheltering some surprising paintings inside. 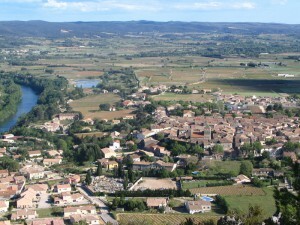 From there you have an excellent view of the peaceful surrounding valley, the “Barry” (hamlet), the “Castellas de Montpeyroux” (Medieval fortress of Montpeyroux) surrounded by the distant fortified walls, and the “Rocher des Vurges” (Rock des Vurges). Go down the hill, going through vines, follow the road leading to the hamlet called “Barry”, situated at the foot of the “Castellas”. 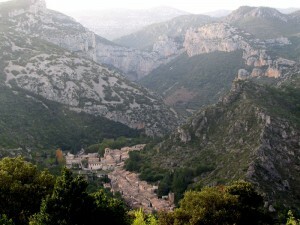 After a tour around the fortified walls, to the North of the old castle, rejoin by a path (orientated North/West) the GR 74 (Grand-ranndonnée N° 74 : marked with red & white) leading to the “Cirque de l’Infernet” and “Saint Guilhem le Désert”. At the intersection of “Saint Guilhem le Désert”, turn right. Once arrived at “Pioch Canis” (height of 451m), at the point where the GR (marked red & white) turns sharply on a hairpin bend, take the footpath to the right which goes down towards a small hillock where a water reservoir is installed, rejoin a little further down, the footpath (on the left) leading back towards the Centennial Olive Tree.